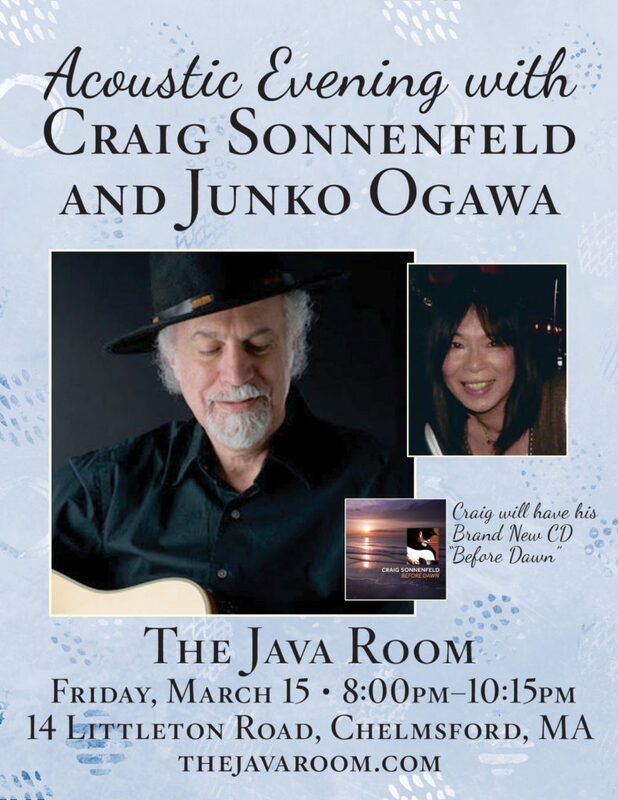 On March 15th, (Friday evening), I will be playing at The Java Room, sharing the show with Craig Sonnenfeld who just released a wonderful new CD. (It really is a great CD titled “Before Dawn,” and please check it out). 14 Littleton Road, Chelmsford, MA, starting at 8pm. They have a wonderful menu and great coffee, and also wine as well. The atmosphere is very warm and serene, and plenty of parking. Java Room has a terrific Kawai grand piano which is always in tune (Thanks to the owner Candy), and I am very excited to be playing the piano again and sharing the music with everyone ! Thank you everyone who was at Roslindale Open Mike on Jan. 14. I along with Rick Goggin were very happy to have opened for Chris Lee for his ROM Anniversary New Year Show ! Hello, Everyone ! Happy New Year ! I hope that you had a wonderful holiday season. Thank you so very much everyone who was at Dylanology CD release show. It was very successful because of all of you who supported and attended and made it happen. I am full of gratitude and appreciation to all of you who supported this event. Thank you. 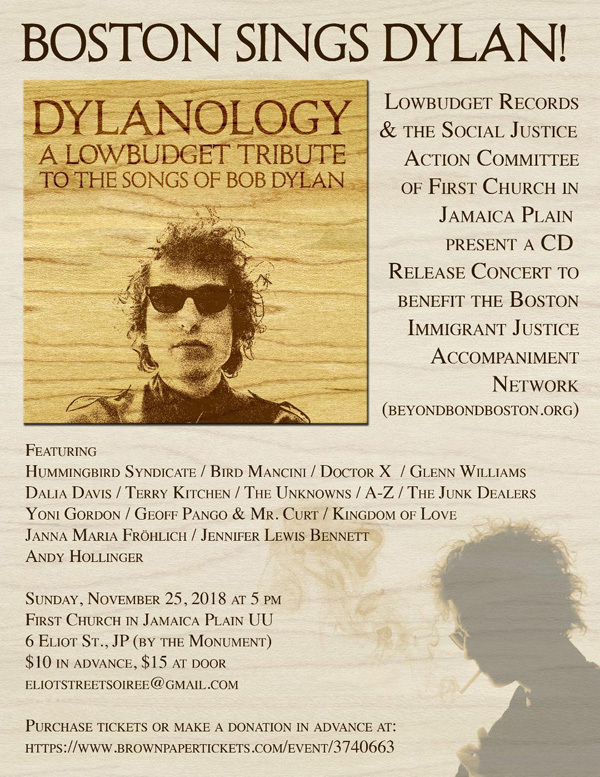 My next show will be Sunday, Nov. 25th at the CD release of the Bob Dylan tribute double CD “Dylanology” by Lowbudget Records. I’m a member of the band “The Unknowns,” and we have contributed 2 songs to the compilation. “The Unknowns” are Rick Goggin, Tim Casey, and myself. This show is also a fundraiser for The Boston Immigrant Justice Accompaniment Network (BeyondBoston.org). We are proud to take part in this show. Details: Sunday, November 25th, at 5pm at the First Church in Jamaica Plain UU, 6 Eliot Street (next to the monument). Tickets are $10 in advance (click here to purchase) and $15 at the door. Thank you everyone who gave a lot of love and well wishes for my back condition. Happy to announce that I am feeling so much better and it was great to perform at The Walnut Street Cafe last Saturday with Miki Matsuki and Branson Bofat. CANCELLATION OF THE SHOW: I so regret to announce that I will NOT be performing this Sunday Nov. 11 th at PCA Open Mike because my back is acting up. I sincerely apologize for any inconveniences I have caused you. No worries. I shall be back and at it soon! 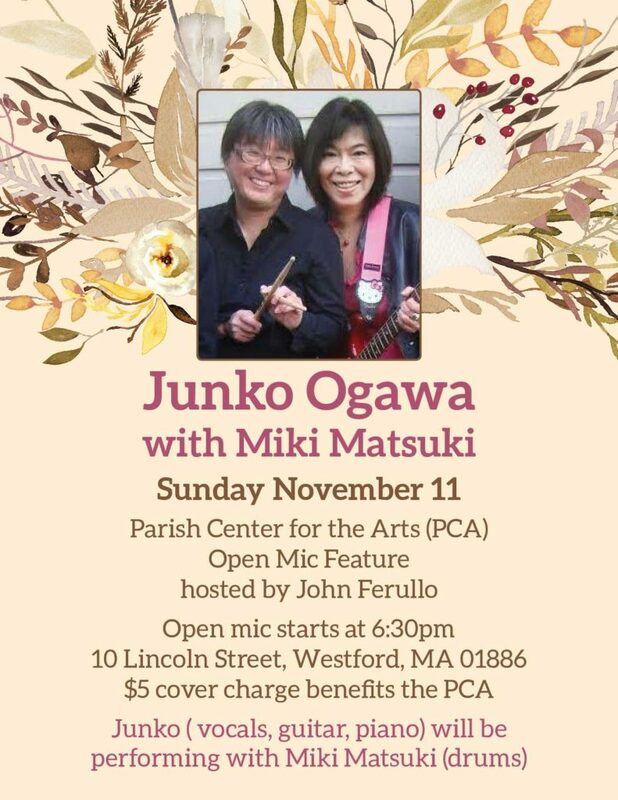 Junko’s next show will be Sunday, Nov. 11 at Parish Center For The Arts (PCA) Open Mic hosted by John Ferullo. 10 Lincoln Street, Westford, MA. I will be performing with Miki Matsuki on drums. The open mic starts at 6:30pm. $5 cover to benefit PCA. 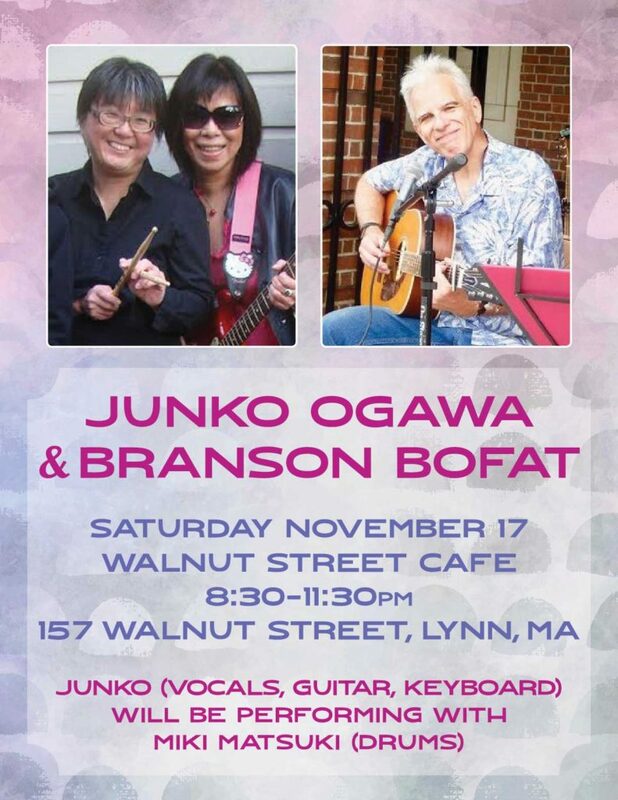 On Saturday, Nov. 17 I will be performing at the Walnut Street Cafe in Lynn, MA. Miki Matsuki will join me on drums, and Branson Bofat will also perform. Thank you everyone who was at Melrose Porchfest. I am grateful for your support. Special thanks to our awesome porch hosts Brooke and Tim. I wished for a great weather for the Needham Farmers Market show and we certainly got a summer like weather! Thank you for everyone who was at the market. I hope that you enjoyed the market and our music. 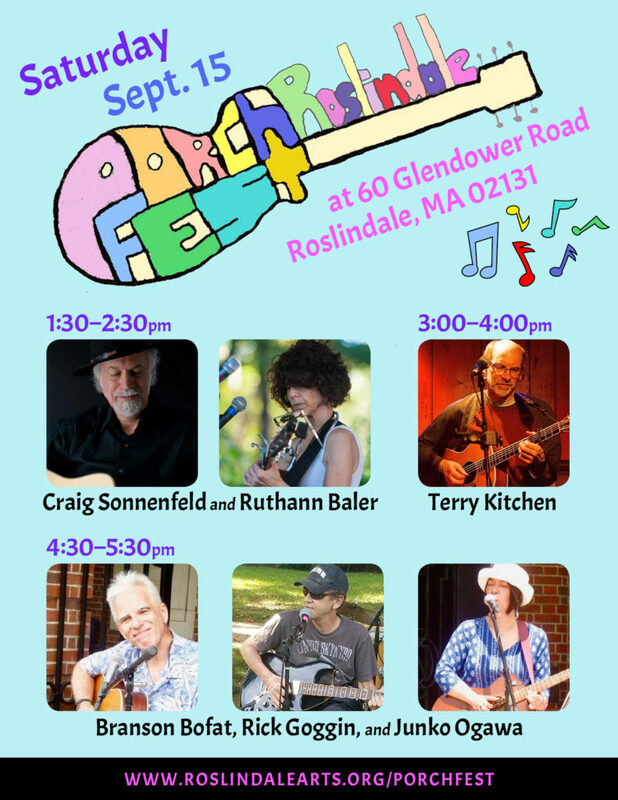 What a wonderful afternoon it was at Roslindale Porchfest today sharing the stage with Craig Sonnenfeld, Ruthann Baler, Tim Howell, Terry Kitchen, Deede Bergeron, Branson Bofat, and Rick Goggin. Thank you everyone who was there and supported us. Special thanks to Terry Kitchen and Cindy McKeown for hosting us. Thank you everyone who was at Hopkinton Farmers Market on Sept.2nd. It was a perfect day, and we had a great time performing for the market. Thank you very much for your support! Thank you for everyone who was at Belmont Farmers Market. J.O. TRIO had a wonderful time performing 32 songs. Thank you for your huge support. Got an invitation for the next season already and looking forward to it ! Thank you everyone who was at Walnut Street Cafe on Aug. 19th. I and Miki (the drummer) had the greatest time featuring at the Sunday open Mic. Thank you for your big support and it was heartfelt. I am happy to announce that I will be back at Walnut Street Cafe Saturday show on Sept 22nd and I will be sharing the evening 3hours show with Branson Bofat. 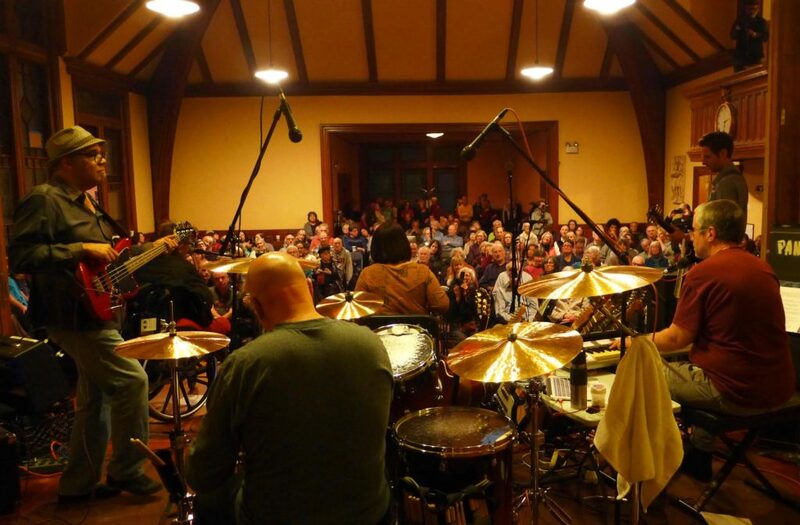 Junko Ogawa Band had a wonderful time playing in Cumberland R.I on Aug. 4th. Thank you for everyone who was there. It was our pleasure to entertain you. 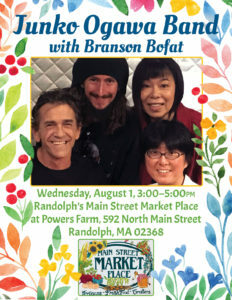 Thank you for everyone who was at Randolph’s Main Street Market Place on Aug. 1st. It was our first time performing for everyone at the market there. Such a wonderful market! I and the band appreciate your support. Thank you. 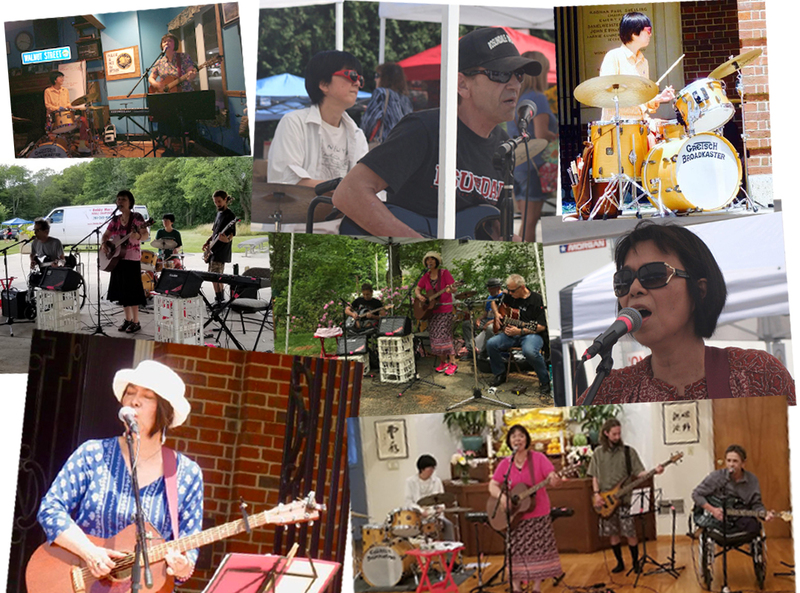 My next show will be a Junko Ogawa Band show (with the full band) on Wednesday August 1st, from 3—5 pm at Randolph’s Main Street Market Place at Powers Farm, 592 North Main Street in Randolph, MA 02638. I will be on vocals, guitar and keyboard, Rick Goggin on vocals and lead guitar, Chris Grant on bass, and Miki Matsuki on drums. Branson Bofat will kick off the show at 3pm. Thank you everyone who was at Needham Farmers Market on Sunday, June 24th. I really appreciate your support. It was such a nice afternoon at the market. Lovely lovely ! Thank you everyone who was at Newton PorchFest on June 2nd despite some rain. It was a fabulous event and I appreciate your support very much. Had a wonderful afternoon playing with Rick Goggin and Miki Matsuki as J.O.TRIO and enjoyed sharing the stage with Branson Bofat and Johnny Flaherty. 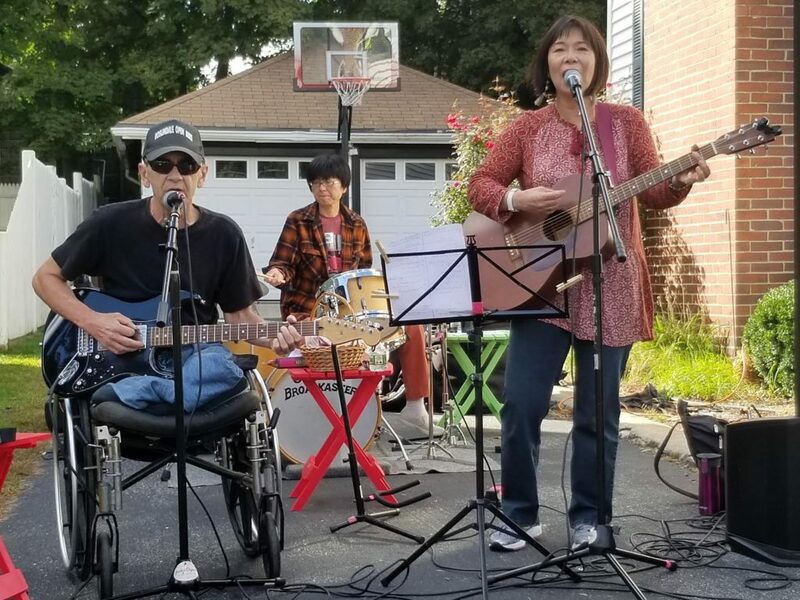 Special thanks to our awesome porch host Lisa and Paul, and the Newton PorchFest committee for making this terrific event happen. 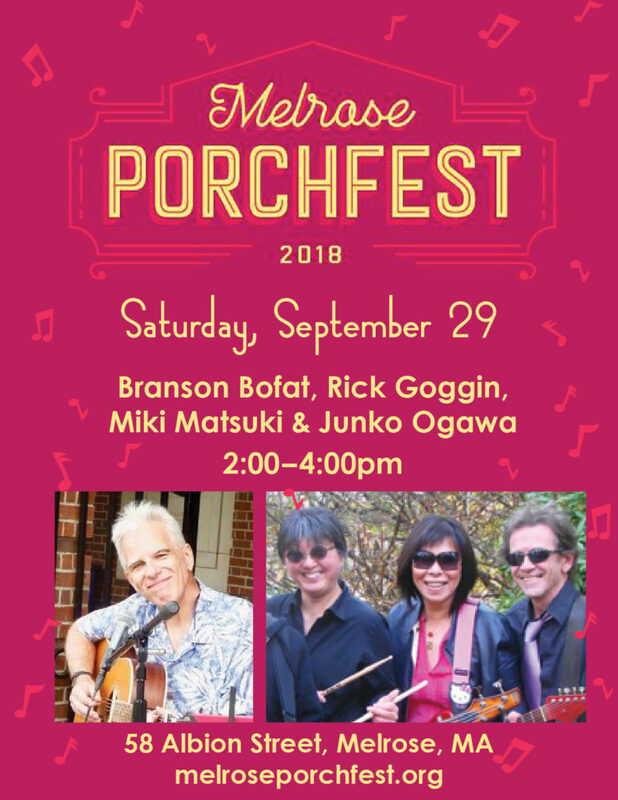 I’m already looking forward to Newton PorchFest 2019! Thank you everyone who was at Club Passim last night. Your support was heart felt and priceless. Thank you very much for being such wonderful audience. 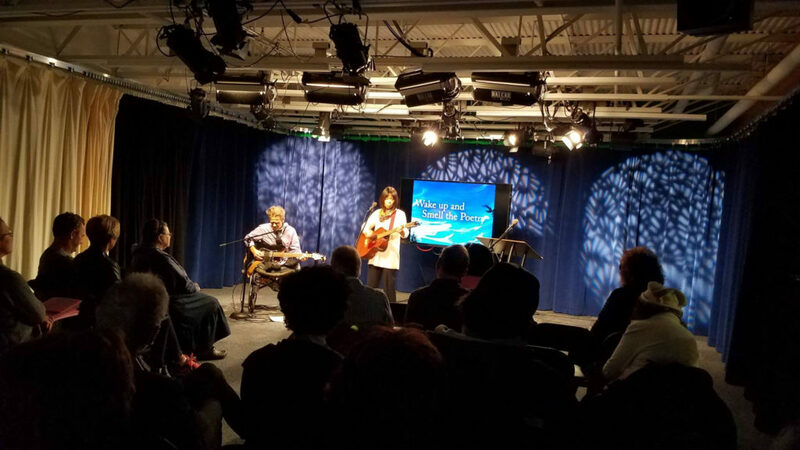 Thank you to everyone for coming to Wake Up and Smell the Poetry on Saturday, Nov. 11 at HCAM TV in Hopkinton! We had a great time. Thank you for your support! Our new special project CD is now for sale! 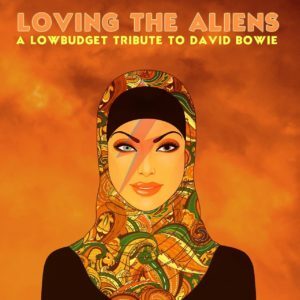 Our band for this project, “Ground Control,” contributed 2 songs for this special double CD: “Loving the Aliens- A Lowbudget Tribute for David Bowie” by Lowbudget Records. Junko, Rick Goggin, Jonathan William, and John Zaria named the band “Ground Control” for this project. Digital versions, CDs and DVDs are all for sale at the Lowbudget Records website. CDs will also be available at Junko’s concerts for $15.